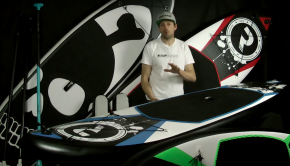 JP Australia launching their 2019 SUP surfing range! Check it out! « The JP-Australia Surf range is designed for the “no-compromise”, top to bottom performance in the proper surf conditions for riders of all sizes. The whole Surf line has unique features; single to double concave flowing into a V tail, pulled in nose and tail, progressive rocker line and thin rails. All new for 2019 is the 8’6”x29”. Werner has slightly thinned out the rails and pulled in the nose and the tail, but the volume remains at 113L.